Arch design has been added. Passive earth pressure. You can specify the part of passive earth pressure to be taken into account in the verification of wall sliding. Default participating passive earth pressure = 1.0, zero (0) no passive earth forces are taken into account. 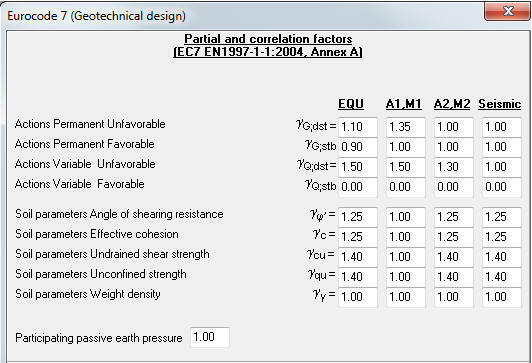 Point of application of earth force in seismic design according to EN1998-5 par. 7.3.2.3. (4) and (5) this is from 1/3 to 1/2. In foundations of steel columns, the water depth over the foundation level has been added. This affects the footing self weight. In footings of steel columns an additional horizontal force for uplift conditions has been added. In retaining walls you have the selection to use separatelly reinforcement for the base and the top of the wall. The basement is casted first with reinforcement dowels over the foundation. Some times, in concrete elements the reinforcements chosen by the program to satisfy the design in Ultimate Limit State (ULS), is not enough for the max crack or max deflection criteria of in Serviceability Limit State (SLS). To take this into account, a new option has been added. In all the design objects: plates, beams, columns, footings, retaining walls, you can now specify the desired reinforcement. If you do not check the Set specific reinforcement, the program computes the reinforcement as usual. If the box is checked, you can specify the reinforcement more than needed for maximum moment in ULS. This reinforcement is used for the additional checks in Serviceability Limit State (SLS), and reinforcement schedules. If the box EC7 Annex D is checked, the soil bearing capacity is computed from Annex D of Eurocode 7. The computations are done simultaneously as you change the dimensions of the structure. If the box Calculation of crack width is checked, the crack width wk is calculated. The load in SLS is computed from the Loading ration (ULS/SLS). 08.07.2016 08.07.2016 New program version. Free Update from the program's main menu. Some times in concrete slabs the reinforcements chosen by the program to satisfy the maximum moments in Ultimate Limit State (ULS) is not enough for the max crack or max deflection criteria of in Serviceability Limit State (SLS). To take into account this a new option has been added. If you do not check Set specific reinforcement the program computes the reinforcement as usual. If you check then you may specify the slab reinforcement (more the the one needed for maximum moment in ULS) and this is used for the additional checks in Serviceability Limit State (SLS). 20.01.2016 20.01.2016 New program version. Improvements and adjustments to Windows 7,8,10. New improved PDF and Word export of report. Preview with thumbnails (if you don't want this thumbnails on the side choose Simple preview). 31.10.2013 31.10.2013 New program version 31.10.2013. 20.06.2013 25.06.2013 New program version 25.06.2013. 07.12.2012 06.12.2012 New program version 06.12.2012. 31.08.2012 30.08.2012 New program version 30.08.2012. 14.05.2012 05.05.2012 New program version 05.05.2012. New Demo version. Automatic paper size to A4 at installation. Design charts for columns in single and double bending with compression. Design charts for deflection control. Cost of Upgrade 120 Euro. We will contact all our customers by e-mail. When you request the new version you will receive a new address for the Upgrade. If you update your BETONexpress from the main menu the ordinary way, you will not install the new version 07.11.2011, but the previous version before the latest upgrade. Free update from BETONexpress main menu. 14.06.2010 14.06.2010 Material factors for concrete and steel has been updated to include more national application requirements. Free update. 21.05.2009 21.05.2009 Material factors updated. Free update. 08.08.2008 08.09.2008 Steeldiameter 25mm added to steel diameter list. Corrections in shear design of beams. Corrections in slender column dimensioning. 15.06.2008 Due to new paneuropean antispam software, the old activation request emails might be blocked from reaching us. If you don't get any response on your Activation code request, please download and install the newest version of the software, then send a new request for activation code. You can also send request for activation code from this site. 30.04.2008 04.029/2008 Correction in continous beam with cantilever. Free update. 20.02.2008 02.020/2008 Import of Command Line Files from various Finite Element Programs. Free update. BETONexpress can also run as a post processor of various Finite Element Programs (ANSYS, SAP2000,) to perform the concrete element design. The communication of BETONexpress with other programs can be done with a command file in simple text format. Each line of this Command line file describes an object that is going to be created in BETONexpress. Commands and data can be read in BETONexpress and the design objects are automatically created. The format of the command text file is described here. Also in Annex of new User Manual. 1.10.2007 Ver.10.011.0207 Update with a few corrections. Limits for redistributed moments in continuous beams and plates, EN 1992-1-1 :2004, 5.5 (4). euk is needed to classify the steel at A,B,C classes, Eurocode2, Annex C. This new version is containing the default values for euk, but you must then reset the values of steel propertiers. Go to [Parameteres/reinforced steel properties], click on [Locked] to unlock, then [Reset] to take the new steel properties. This wil not reset other material properties of the program. 19.03.2007 Ver 03.005.07 Update with a few corrections. 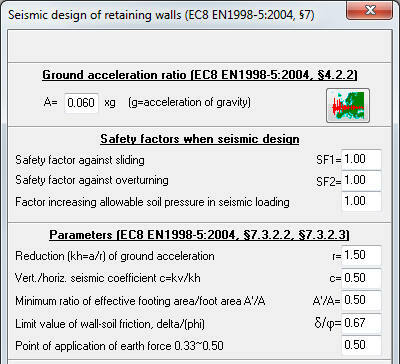 A new version of BETONexpress for concrete design adapted to the latest versions of Eurocodes is available. Cost of Upgrade 120 Euro. We will contact all our customers by e-mail. If you request the new version you will receive a new address for the Upgrade. If you upgrade your BETONexpress from the main menu the ordinary way, you will not install the new version 03.02.2007 with EN adaptions and automatic generation of CAD drawings. If you request the new version you will receive a different address for the Upgrade. The new version includes all previous options. For concrete design Eurocode 2, EN 1992-1-1:2004, Design of concrete structures, General rules and rules for buildings. For geotechnical design, Eurocode 7, EN 1997-1:2004, Geotechnical design  General rules. For concrete design you can now choose Eurocode 2, EN 1992-1-1:2004 or (EC2) ENV 1992 Design of concrete structures. � Automatic generation of CAD drawings for spread footings, retaining walls, corbels and deep beams. � Steel schedule for every design object in the end of its report. � Export of Report to PDF and Word format. � New adjustments of report, references aligned, bold. etc. � New algorithm for steel bar selection. � Choose units for rebar representation in reports. � Adjustments of Reinforcing steel bar weight. � Continuous plates - Coefficient of load distribution (k) for each span. � Axial force (tension or compression) in section forces. � The diagrams for single and double bending are computed by numerical integration of forces over the cross section, and they are shown in the report. � In Parameters/Parameters for reinforced concrete/Footings you can specify if you want for the min and maximum reinforcing steel areas to apply the requirements for plates �9.3.1. Eurocode 2 is not clear on this subject. � In Parameters/Parameters of retaining walls/Eurocode 2 you can specify if you want for the min and maximum reinforcing steel areas to apply the requirements for plates �9.3.1. Eurocode 2 is not clear on this subject. 28.02.2007 Ver 02.17.07 Last update of BETONexpress without CAD modulus and EN 2004 adaptions for concrete and geotechnical design. To install this version, enter BETONexpress/Update. .
Save to disk and unzip to where the program is already installed. 20/12/2006 Ver 12.00.06 New update. 12/12/2006 Ver 12.00.06 New Trial DEMO with all the features describes underneath. This upgrade is still based on the ENV version of Eurocode 2. The upgrade is free of charge. After the upgrading, when you first run the program again, we advise you to go to the menu Parameters/View parameters settings and click on [RESET to all original values] in order to reset to the new default values. For old files you have to recompute the design objects. Automatic calculations as you alter the input data, and direct preview of full report. Export of report with drawings to PDF and Word files. You can select units for the rebar representation in the report from Setup/Units in report. You can adjust the rebar weight from Reinforcing steel properties/Weights. Two ways plate analysis. The method of Czerny is added. In continuous plates, a load factor has been added at each span, to take care the two way load distribution in some cases. New approach for single and double eccentricity with numerical integration. M-N diagrams obtained from numerical integration are included in the report. Column capacity, and column capacity with FRP. Diagrams have been added in the report. The depth of footing and the soil weight have been introduced. Negative (upward axial Load ) can be specified. The minimum reinforcement can be evaluated as plates (option Parameters of Reinforced concrete/Footings/requirements for min-max reinforcement as slabs), as the Eurocode is not clear on the subject. The minimum reinforcement can be evaluated as plates (option Parameters of retaining wall/Eurocode 2/requirements for min-max reinforcement as slabs), as the Eurocode is not clear on the subject. 23/11/2005 Ver.8/2005 Adjustments in minimum reinforcement of columns in biaxial bending. 27/08/2005 Ver.8/2005 Improvements in the calculations of minimum reinforcement of slabs. 01/04/2004 Ver 03/2004 Paragraph numbering and table of contents utilities added in preview and reports.